Now that we’re officially in the throes of winter, I find myself craving nature’s greenery. I have to admit, in the summer I sometimes have nightmares that it’s snowing outside and I wake in a panic! 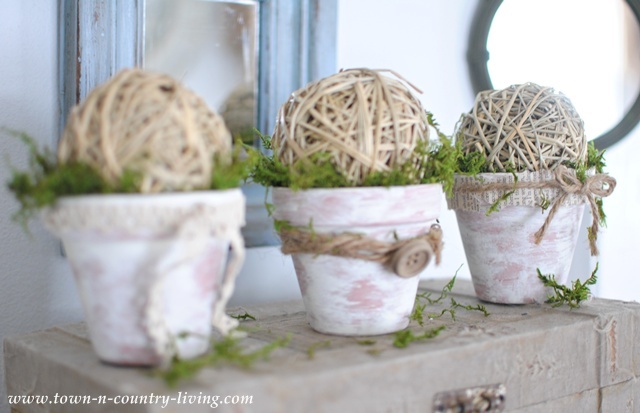 I’m definitely a warm weather kinda girl and try to find comfort during these frosty days by adding natural elements to my home whenever possible. 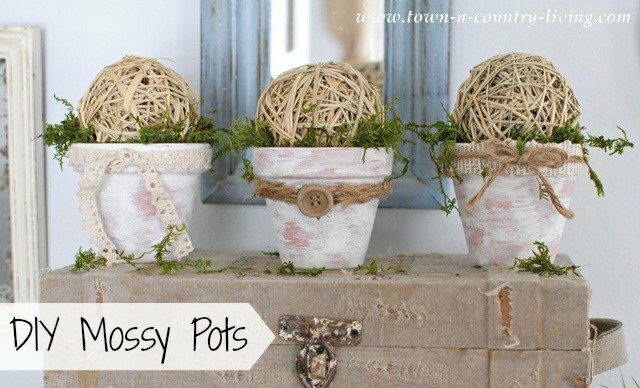 Today I’m happy to share these DIY Mossy Pots with you that are so easy to make and look cute, too! 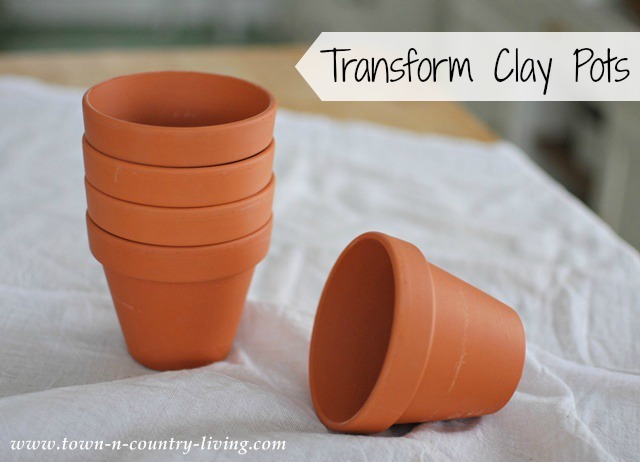 Start with inexpensive clay pots for under $1 each. 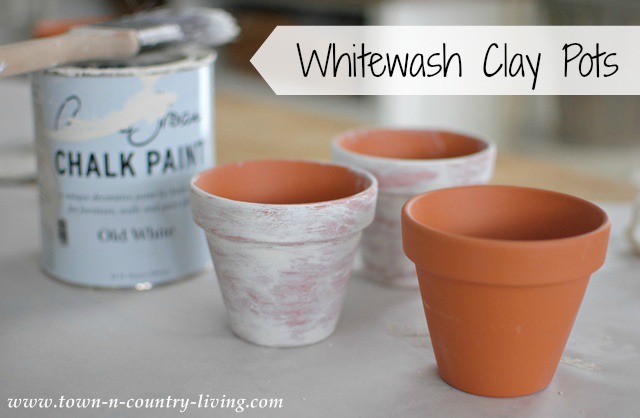 Whitewash the clay pots with Annie Sloan Chalk Paint or similar. Immediately wipe the pots with a damp rag, working quickly. Remove as much or as little of the paint as you want. The clay soaks up the paint and it dries quickly so you need to work fast. 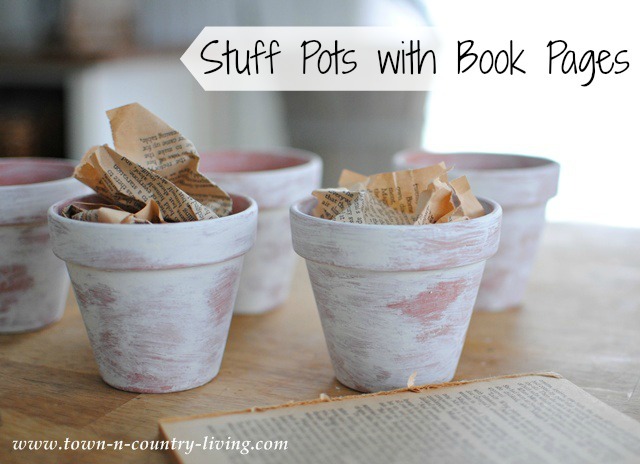 Once the paint dries inside and out, stuff the pots with crumpled book pages. You can use anything as filler for the pots, really. 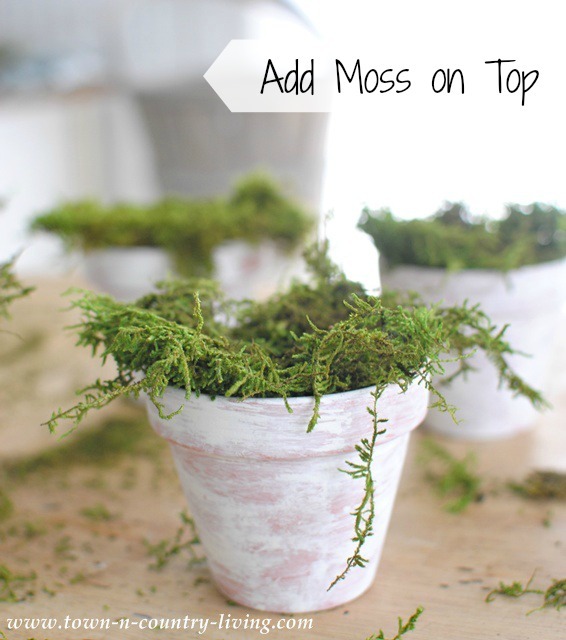 Add a layer of moss on the top of the pots. You can find a variety of moss at your local craft store. 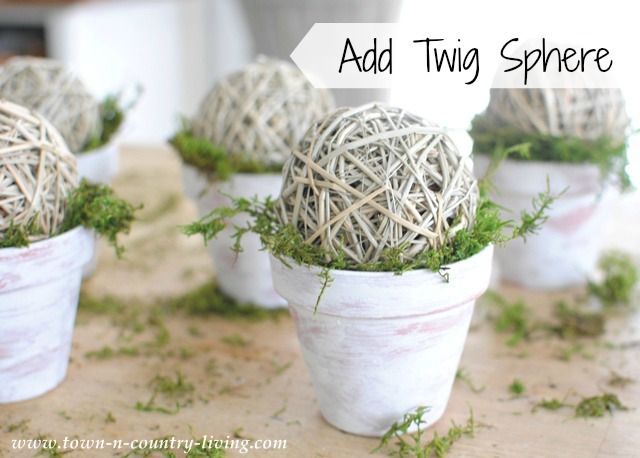 To finish your DIY Mossy Pots, add a twig sphere or other decorative element. 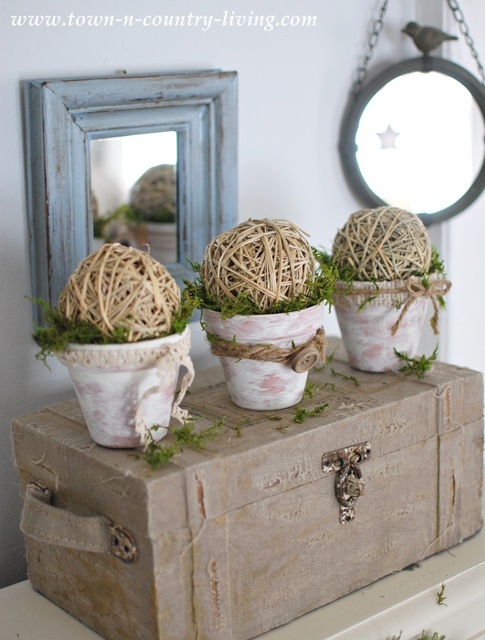 If desired you can embellish the pots with ribbon, twine, or whatever else happens to suit your fancy. 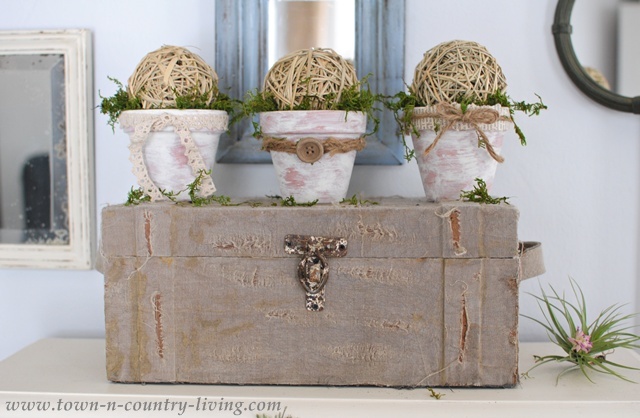 The first of my DIY Mossy Pots wears a torn book page strip with a little twine bow. 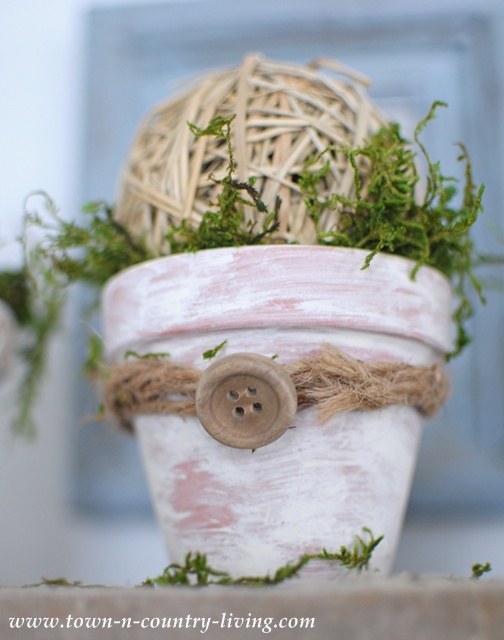 This DIY Mossy Pot also has twine wrapped around it, but has an old button to finish it off. 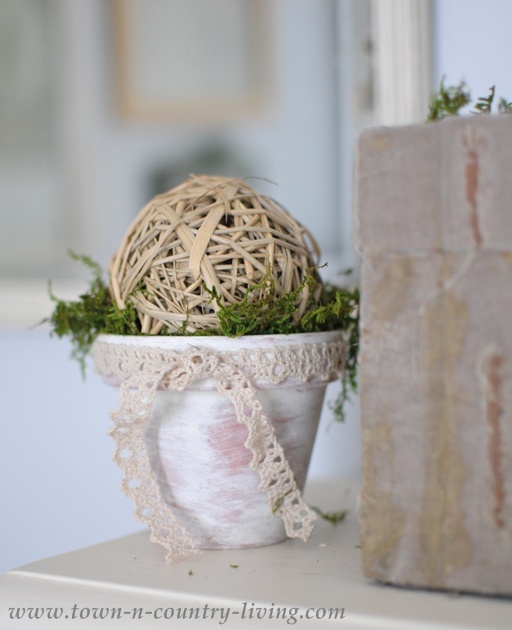 This little pot simply wears a piece of crocheted lace. 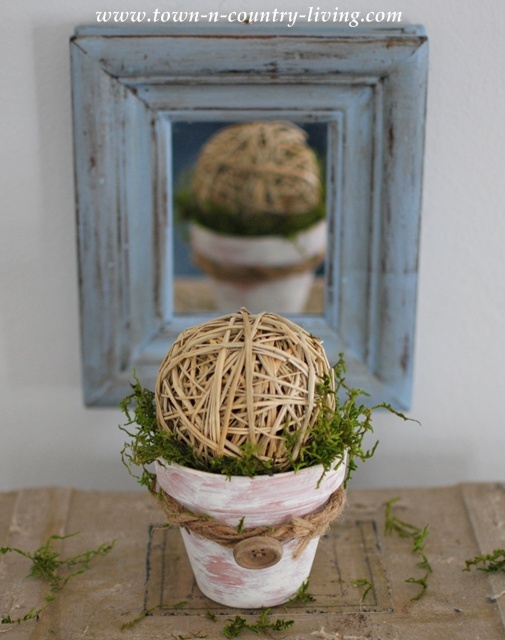 I love these little DIY Mossy Pots and they didn’t take much time or money to make. Hope you enjoyed this quick and easy tutorial! 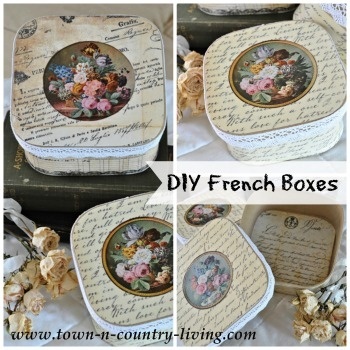 I’ve got a whole list of other DIY projects that I plan to share with you in 2014 so be sure to follow me via email, on Facebook or Pinterest, or subscribe to my feed! 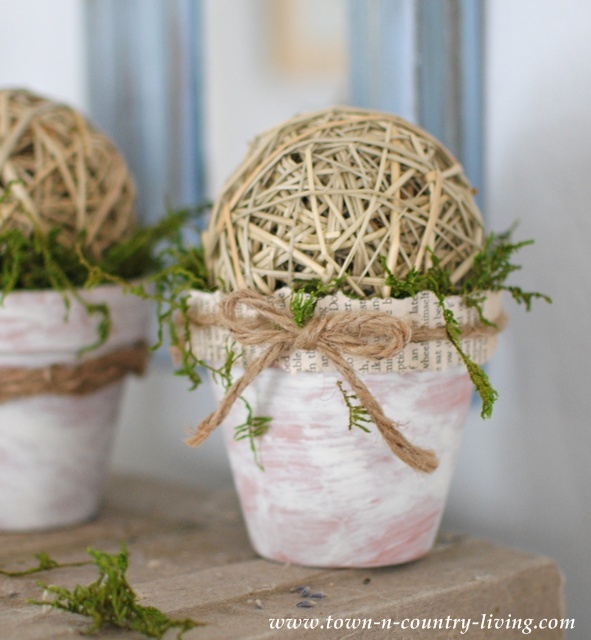 These pots are perfect for winter decor. Just enough green. Love the button embellishment. Jennifer these are so cute. I am a cold weather girl for sure. Don’t love snow but love the cold. Jennifer you could sell these 😀 They are just so sweet, and your instructions on how to make them is great 🙂 I like the cold weather – you wouldn’t think so; I live in tropical Queensland 😉 35 degrees celcius on Christmas day! These are fantastic! So very pretty! 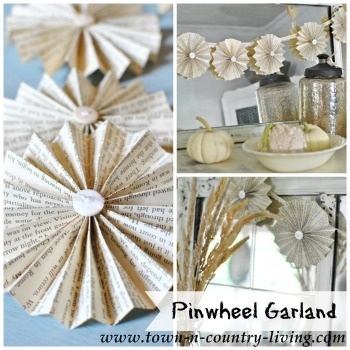 So pretty and so easy too!